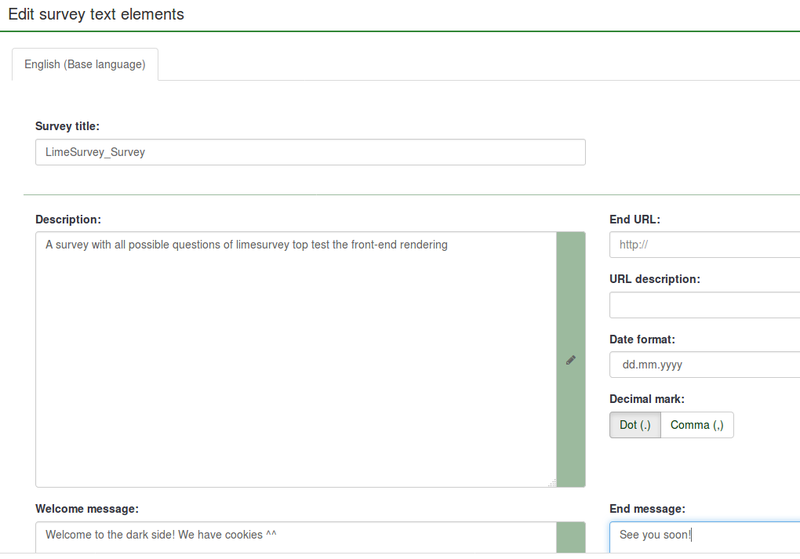 From the survey text elements panel you can edit the title of the survey and its description, welcome and end messages, end URL of your survey, and the format of the decimal mark and date. The title of the survey can be changed in this field. You can add a survey description. You have the possibility to redirect users to another page when they finish filling in the questionnaire. If you wish to redirect them, type in the URL and activate the automatically load URL option that is located under the Presentation & navigation tab. A short end URL description can be added in the case in which the user is redirected to a non-related survey webpage. It may help the survey administrator to add notes vis-à-vis the usage of the respective URL. This option is important when you want to record timestamps together with the survey participants' answers. If you click on it, a drop-down list will show up with a multitude of date formats. Choose the one that fits your survey respondents. Do not forget that different date formats are used across the world. For example, it is recommended to use a different time format if your questionnaire focuses on the US market (mm-dd-yyyy) and not on the British market (dd-mm-yy). Two options are available: dot (.) and comma (,). Choose the one that fits the place where you conduct your study (e.g, US vs Germany). Type in a message that will welcome the survey participants when they access your survey link. Type in a message that will be displayed to the survey participants once they finish the questionnaire. If the end URL field is automatically loaded, the end message is not displayed anymore. Hint: If enabled from the global settings, use the HTML editor to better customize the welcome and end messages, and the description of the survey. If your survey is multilingual, each language will have a corresponding tab on the languages toolbar (they will be displayed after the base language). This page was last edited on 19 March 2019, at 21:59.